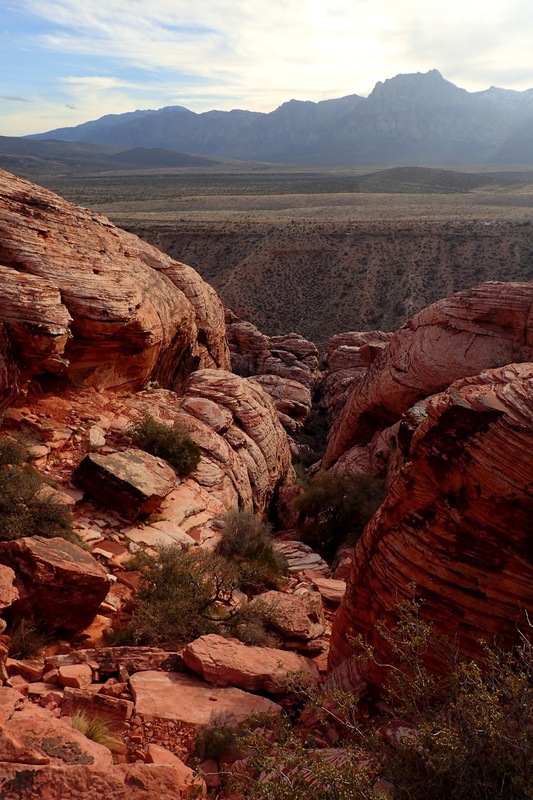 I reached the car much earlier than expected, and after drying off and having some food I exited the Red Rock loop – almost pulling out onto the wrong side of the road! I decided I’d have just enough time for a quick trip through Toad Pool Canyon. I didn’t want to drive the loop again (its one way), and besides Calico 1 was closed (the easiest way to access the canyon). 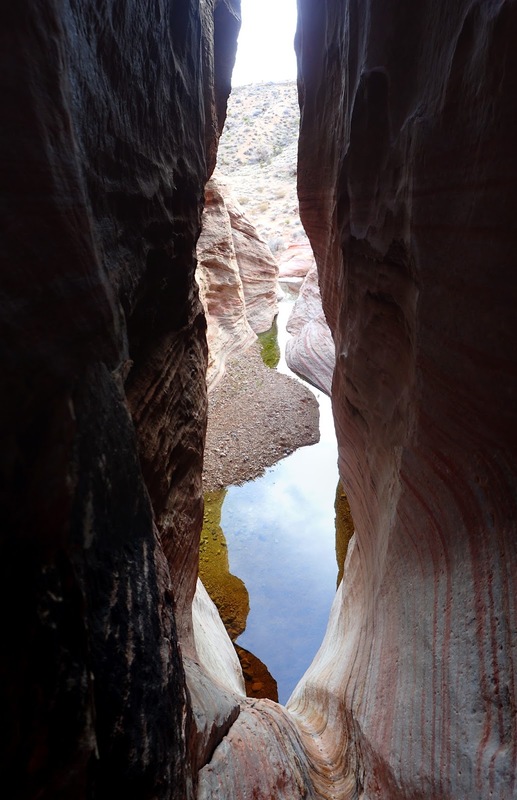 So I parked at the Red Spring picnic area instead, through a couple of ropes in my pack and headed off on the trail that heads around the red sandstone. Instead of taking the trail I scrambled up onto the top of the sandstone and contoured around to the top of the canyon. 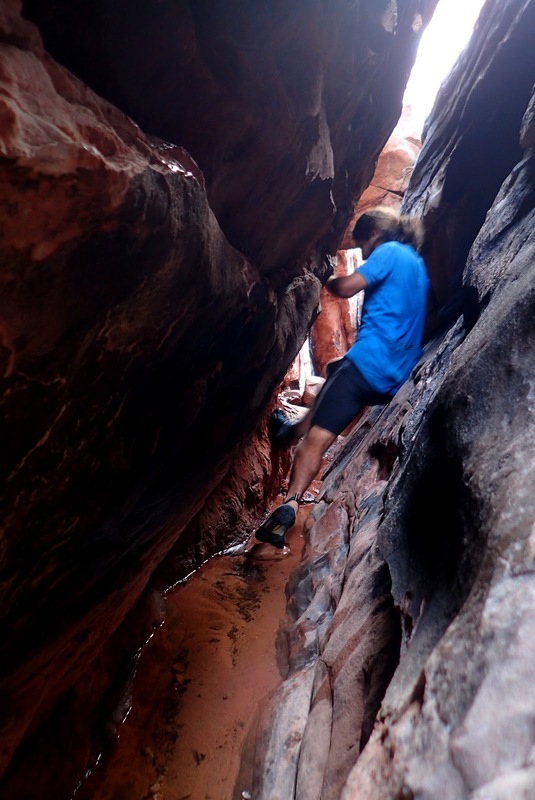 This was a fun and sporty way to get to the top of the canyon, lots of scrambling and climbing. A few times I thought it wouldn’t go, but there always seemed to be some way to climb up, down or around. And soon I was there. I walked down the drainage and soon reached the first pitch: it ran over the top of a large chock-stone but I couldn’t find any set anchor, and in my rush I hadn’t taken any mallions or tape/webbing. After a bit of poking around I found a hole you could climb down beside the chock-stone, After lowering my pack some difficult down-climbing and chimneying got me to the bottom. The sandstone then opened back up and some weaving through shrubs followed. 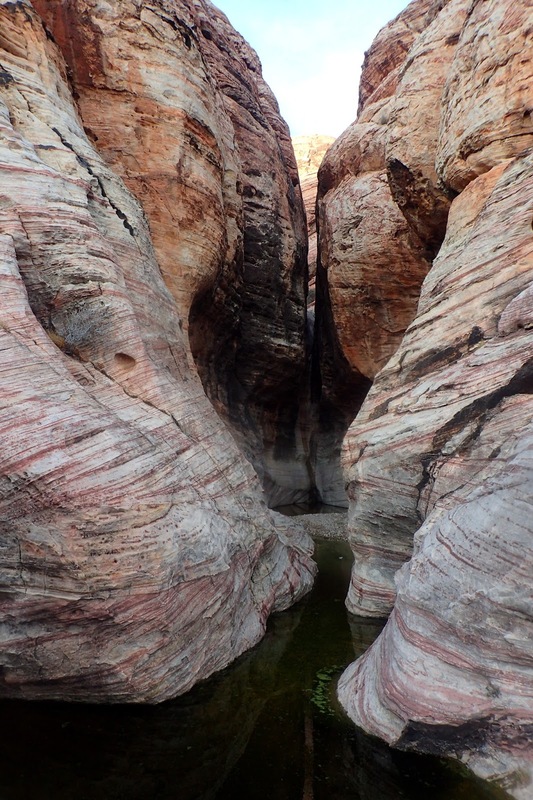 I wasn’t thinking too highly of the trip, but I soon arrived at an impressive slot with water at the bottom. Time for some fun chimneying! A easy down climb and a much wider slot followed before it again opened up. I then looked down what was supposed to be the second abseil/rappel. The sandstone was beautiful! It didn’t look too bad to downclimb, so down I went, dropping into the thigh deep pool (the Toad Pool) at the bottom. The last rappel was the hardest to downclimb, but before you even got to it there was the exercise of avoiding a murky, algae filled pool (the last pool had been crystal clear!). I bridged across most of it, climbed out on the left and then jumped over to the right. 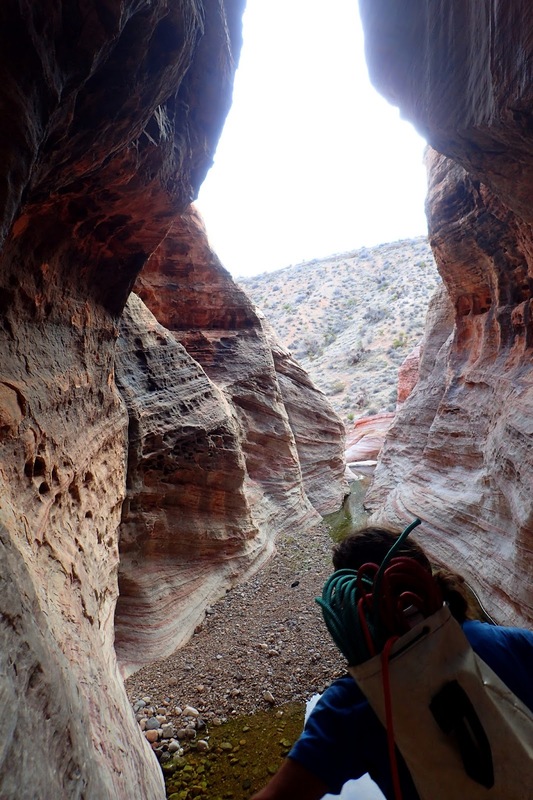 I then climbed/slid down the last rappel which lands you on a trail. 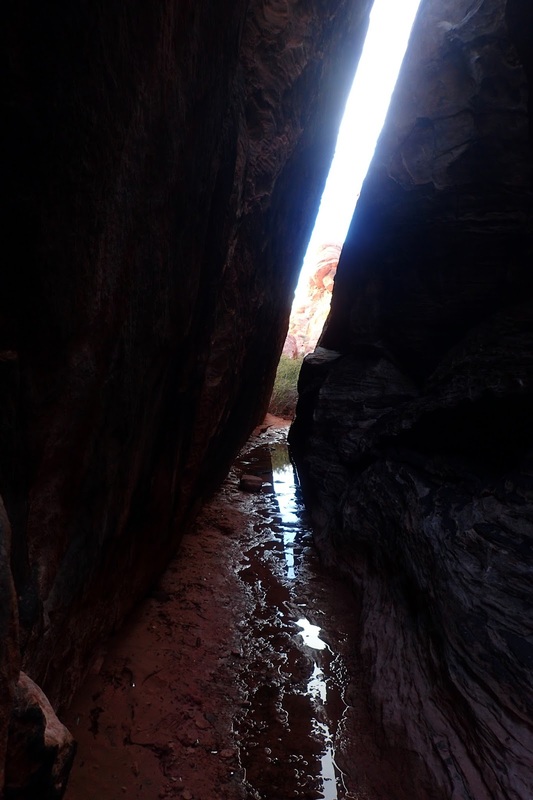 I followed the waterway back to a rock climbing trail and was soon back at the car. Quite a fun little trip!